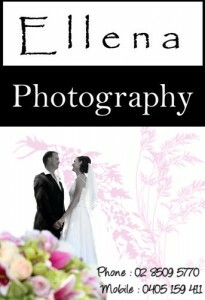 Of the 1,374 professional Photographers in Sydney what makes Ellena Photography so special? Why should you trust Ellena Photography to capture those special moments on your wedding day, shoot portraits of your children, take pregnancy photos, cover an important fashion parade or create your modelling portfolio? The answer is simple. Ellena is the consummate professional when it comes to photography. A Sydney Institute of Technology graduate with a diploma in photography Ellena has been a professional photographer for over six years. Apart from her many Wedding and Fashion Photography assignments Ellena is also an official Photographer for the Wildlife Preservation Society of Australia and an accredited photographer for many of Sydney’s premier fashion events including the Rosemount Fashion Week 2010. As well as being a well known and respected Photographer in Sydney Ellena has the ability to create a relaxed atmosphere for her clients. Her pleasant easy-going nature is reflected in the smiles and relaxed poses of her subjects. That along with a very competitive pricing schedule and a flexible timetable should put Ellena on your “must call” list when looking for a Photographer in Sydney. Click here for contact details or call (02) 8509 5770 or (0405) 159 411.